Sharon Salisbury O’Toole is a contributor to Writers on the Range, the opinion service of High Country News. She is a writer, blogger and rancher. I am appalled because my ranching family has had a long and mostly positive relationship with the Bureau of Land Management and its personnel. At our best, together we have worked magic on the landscape, planning long-term projects in a collaborative fashion, and then seeing the results. There have also been less productive interactions, a few of them downright hostile. The Bundys had reason to believe that the government is out of line. When the government bought out 52 of their neighbors’ grazing permits, ostensibly for desert tortoise habitat, the Bundy family refused the deal. As grazing leasees on federal ground, we understand we have agreements that are critical. The Bundys refused to recognize federal ownership of the public lands. After their federal lease was cancelled, they began trespassing on their former lease as well as leases of their neighbors. It was unfortunate that Cliven Bundy, who had been making some good points about federal overreach, turned his attention to social commentary in a manner offensive to me and to most Americans. It was also unfortunate that federal officials brought an estimated 200 snipers, personnel armed with tasers, helicopters and police dogs to conduct a roundup of some 900 cows owned by Bundy in the midst of calving season. Predictably, hundreds of heavily armed self-styled militia types showed up to support Bundy and face off federal officials. Soon a full-fledged standoff was underway. 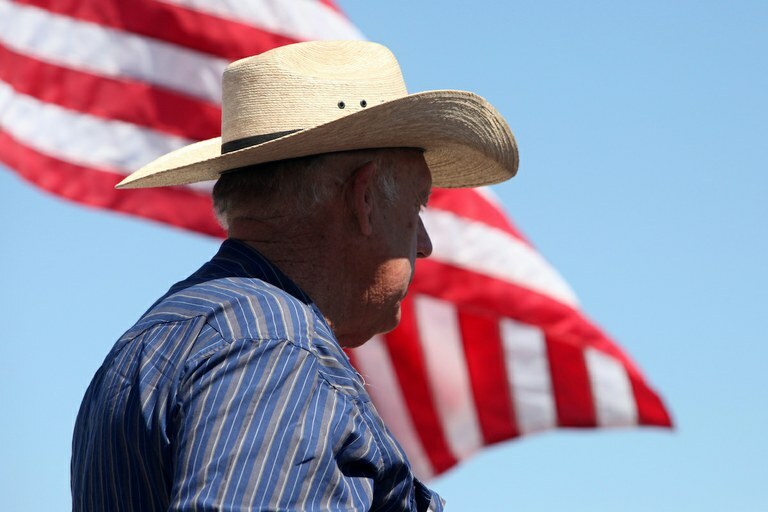 Cliven Bundy looks out at the 2014 Bunkerville stand off. The trial regarding the standoff just ended. After several tense days, the government forces withdrew, not wanting another “Ruby Ridge” on their hands. Apparently, the Bundy sons wrongly interpreted the situation. They failed to understand that like it or not, most citizens of the West work within the system of federal ownership of public land. After all, about half of the West is managed by federal agencies. In the meantime, another family was devastated. Harney County, Oregon ranchers Dwight, 76, and Stephen Hammond, 48, who had a history of conflict with the BLM and the Malheur Wildlife Refuge personnel, were convicted of arson. They testified that they had set a “backfire” in order to protect their grazing land. Initially they were convicted and also paid $400,000 in restitution. The U.S attorney successfully appealed, arguing that the law demanded a minimum sentence of five years. Despite arguments of “double jeopardy,” the father and son were ordered to serve longer sentences. This was one of the sparks that incited the Bundy brothers to occupy an Oregon wildlife refuge. Ammon and Ryan Bundy, neither of them ranchers, were emboldened when the government failed to impound their family’s cattle. Without the approval of the Hammonds, whose cause they claimed to be upholding, they and some supporters “took over” the unoccupied Malheur National Wildlife Refuge headquarters. After a six-week “occupation,” and the death of supporter LaVoy Finicum, the occupiers had either left or been arrested. Several of those arrested plea-bargained or were convicted and imprisoned — one for 68 years. In a prosecutorial mistake, government attorneys chose to charge the Bundy brothers and their supporters with conspiracy, instead of the clear crimes of trespass, illegal use of firearms and threats. The Oregon jury did not convict because the prosecution could not prove conspiracy. Cliven Bundy was arrested when he came to visit his sons, and the three men were moved to Nevada to await trial for the 2014 events surrounding the cattle roundup. Which leads us to the recent stunning dismissal of the charges against the Bundys. Again, it seems clear that they violated the law. It is astonishing that the prosecution did not learn from the Oregon trial, where a juror cited the prosecutors’ “air of triumphalism.” U.S. District Judge Gloria Navarro cited “flagrant prosecutorial misconduct” in her decision, and ruled “with prejudice,” which means a retrial is prohibited. The U.S. attorney announced she may appeal the decision. It takes wisdom, patience and humanity to make our system of federal land management work. In the case of the Bundys, both sides failed. It is ironic, too, that the legal system the Bundys assailed protected their rights in the end. We are, indeed, a country of laws. The Bundys have returned to Bunkerville. Some supporters are still jailed. Millions of taxpayer dollars have been spent. LaVoy Finicum is still dead. Go figure.